Recently, we turned our clocks back. Everyone always appreciates that extra hour of sleep at first, but then it seems that it gets dark just after your lunch break. Even though it is already dark on your commute home from the office and you had to dig a light jacket out for the beginning of the season, we are still lucky that we haven’t seen any of that dreaded snow yet. Hopefully Mother Nature doesn’t read this blog or she might drop some snowflakes out of spite! The point I am trying to make is that we still have a little window of opportunity to use our outdoor living spaces for warm and inviting entertainment. Carpe diem before the winter shovels make their grand appearances! Don’t let the cooler temperatures deter you from enjoying outdoor quality time with your friends and family. There are several ways to turn your chilly nights into entertaining autumn bashes. With the sights and smells of autumn all around you, it won’t be long until a smile takes over your face! Grab a cup of cocoa or spiced cider, call your friends and family and plan a gathering! When the weather outside is teetering on frightful, the number one item needed for your fall festivities is a heat source. Built-in fireplaces are an excellent way to get cozy with your significant other to enjoy the light and heat of a fire. If you are more in the mood to entertain a group of people, a masonry fire pit is what you’re after! Your guests can sit 360° around a fire pit, which is perfect for unobstructed conversation and laughter! Having a sitting wall around a portion of the fire pit is the perfect built-in accessory! This open-air seating gives everyone the chance to roast marshmallows for s’mores or take the opportunity to cook a hotdog on the crackling flames to round out the year. Nothing brings people together quite like food! If s’mores and hotdogs just won’t cut it for your hungry bunch, you can still fire up the grill to create some culinary cuisine! Grilling in the fall is always more comfortable than that sweaty feeling you have standing over an open flame in the middle of summer! An outdoor kitchen takes grilling a step further by incorporating counter prep space, as well as areas to install other features like a refrigerator to keep the brews frosty and storage space for snacks. So if you run with a ravenous crowd, the extra space will definitely be appreciated. Once the meal is prepared, you will need some extra lighting to see what you are eating! 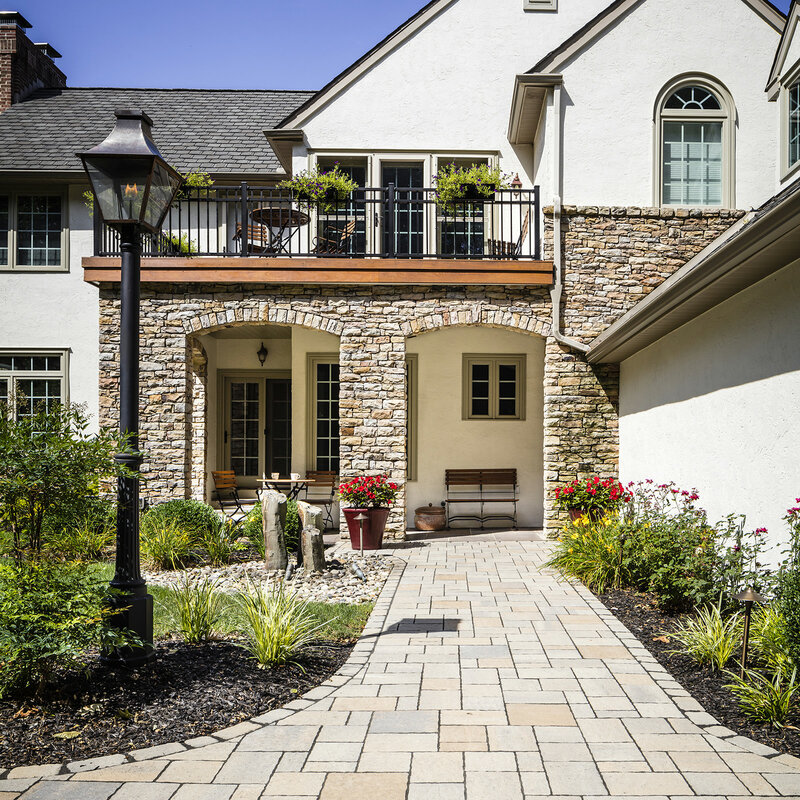 The use of accent and landscape lighting brings your whole outdoor living space together. 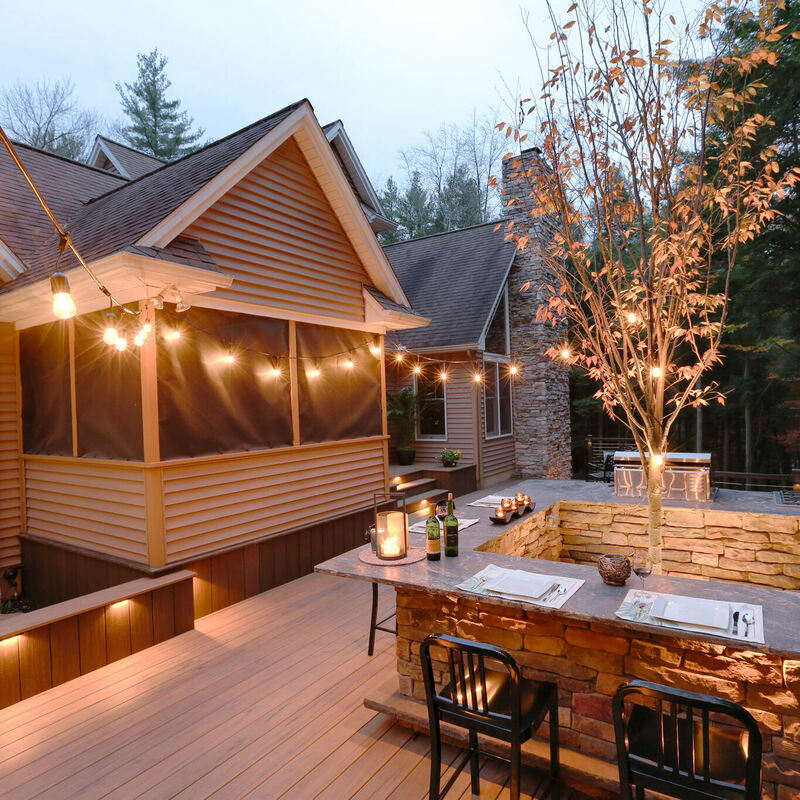 Dimmable LED recessed lighting in the roof of a covered patio or deck is perfect for when you are throwing a party. You can control the intensity of the light to fit the mood of the soirée. In the case of a crisp fall night, dimming the lights keeps the cozy mood alive. Don’t forget to include path lights so your guests can find their way at the end of the evening without tripping over the dog! Incorporating wow-factors into your outdoor living space never goes unnoticed when entertaining. The swimming pools may have closed up for the season, but hot tubs are perfect for the fall weather! Kick off your night with fire, food and fun and wind down with a relaxing dip in the hot tub. An even better scenario would be to enjoy your hot tub experience with professionally installed outdoor rated speakers and television nearby! Are you daydreaming about it already? The possibilities for your own backyard are endless! Just because the temperatures take a little dive around this time of the year, doesn’t mean we can’t still enjoy our outdoor spaces. 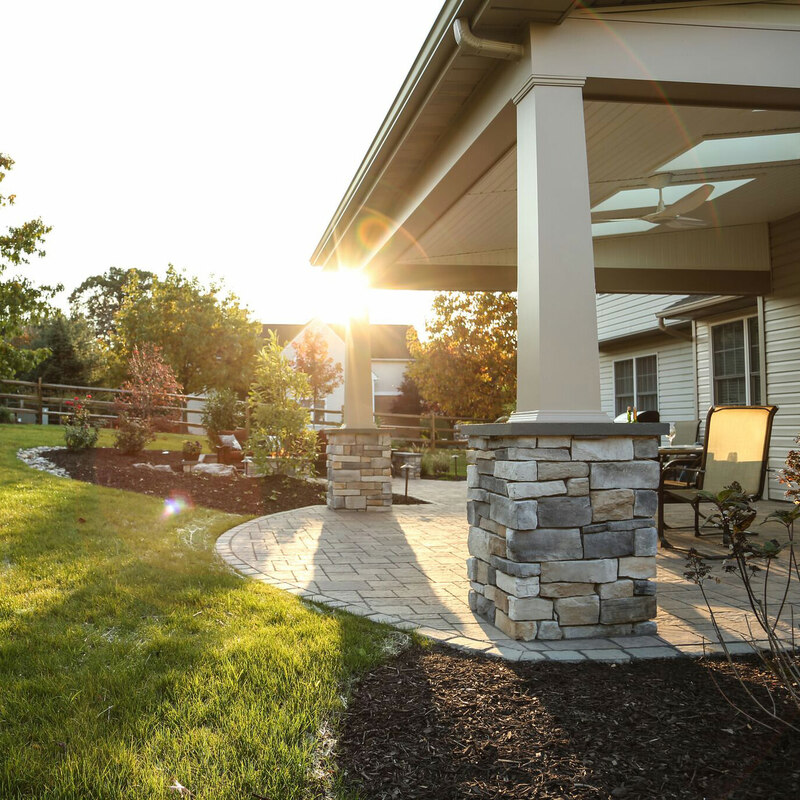 Have you been dreaming of your perfect backyard and just haven’t had the vision or know where to start? MasterPLAN Landscape Design specializes in backyard transformations, and it all starts with your custom 3D landscape design! Reach out to MasterPLAN to talk about the options for your backyard transformations. Let’s start planting the seeds today!